Realizing that I have only 44 days until I return to the States, I decided that I had better start getting some things into place. I sold my Ford F-350 truck when I came to Iraq and have been looking on and off for a replacement vehicle. I loved my F-350 but it just didn't get enough miles per gallon. I will probably still have to work outside the farm for a while and being that the farm is in the middle of nowhere, I will have to travel 30 to 50 miles to work, if I can't find anything closer. Now, I am one who likes a bargain. Some people would call it cheap, I prefer thrifty. I have been searching Craigslist Bloomington for a small truck. I found a beauty a couple of months ago but it was really to early to buy something, since it would be a long time before I could pick it up. Last Friday, I decided to check out Ebay. I found this sweet little red truck, a Ford Ranger. It was close to the end of the auction with a very low bid. I thought about it all day, checking the values of a truck of that year, features and mileage and finally decided I would really like to have the truck. I emailed a friend, who only lives about 10 miles from the seller. I asked him if he could pick it up and store it until I got back, if I won the auction. He assured me it would be no problem. That was my green light to bid. 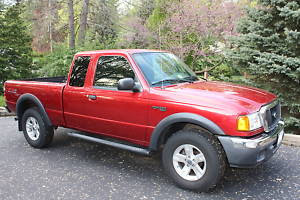 So, here she is, my 2004 Ford Ranger XLT 4X4 Fx4. Not as good as a sheep or goat but more necessary.